Princess and I took a much needed and impulsive road trip to a southern state fourteen hours away. My parents were visiting my sister from their home in Florida. We decided to visit them. So we left at 5 am to make the drive in one day. Okay…so 5 am plus 25 minutes to shower plus 10 minutes to gas up and 20 minutes to make a quick stop to pick up ring bologna and blueberries for the folks. THEN, we hit the highway. When you are driving south on I-75, Ohio has to be our least favorite stretch of road. That state goes on forever. Princess prefers to sleep through it…and did this time. Once she was awake – and sitting in the front seat – our road trip took off. Really took off. It was very educational for both of us. 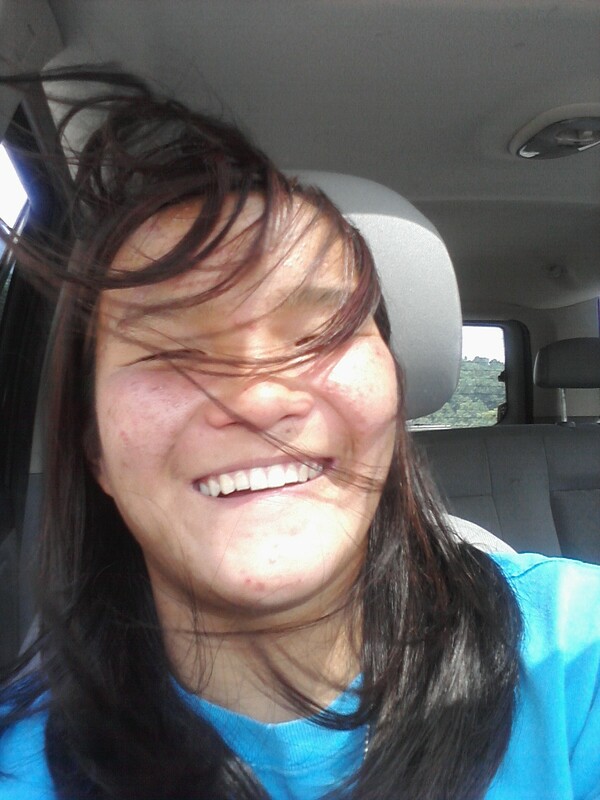 And these are the things I observed…..
#1 We are both ‘wind in our hair’ kind of gals. HRH and the Prince prefer windows closed and the AC chilling. Princess and I are happiest when the windows are down and the wind is blowing and the i-pod is blasting tunes through speakers that are vibrating against your shin. #2 Playing with a Mom’s new cell phone can allieviate the boredom of a car ride….especially when you discover that you can send text messages from that new cell phone to your own cell phone. Texting yourself? How revolutionary! #3 Kudzu is on the move. 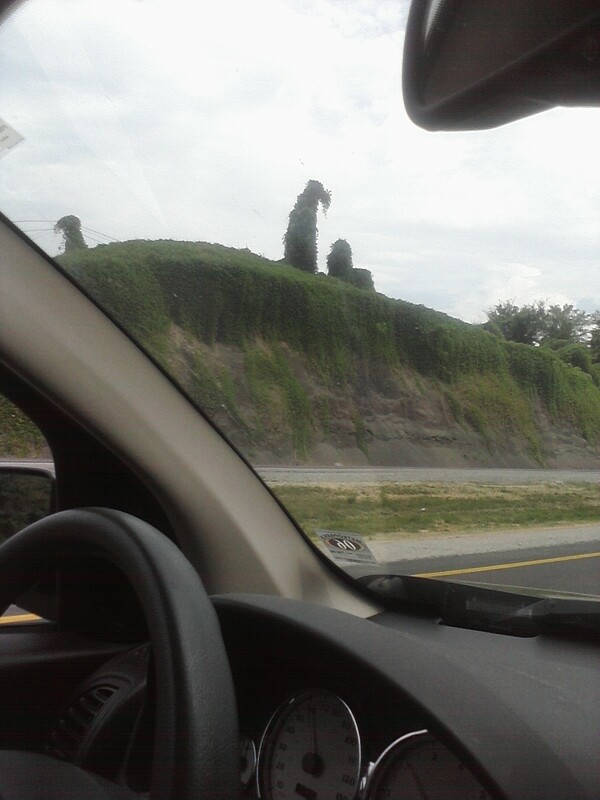 For the very first time I sighted this ominous vine in northern Kentucky along the free way….in three places. I first learned about kudz uwhen we went to a kudzu festival in South Carolina many years ago. It was a plant transplanted from Japan to help deterr the erosion of the sandy soil. Kudzu in Japan is a food delicacy and also has a dormant period in it’s growth cycle during the winter months…..cold weather that is absent in the American south. Kudzu completely covers the ground, wraps its self around trees and bushes and will even swallow up buildings. It grows eight inches in one day. Driving past a kudzu laden stretch of area can give one pause. Creepy, scary ‘Where The Wild Things Are’ kind of pause. 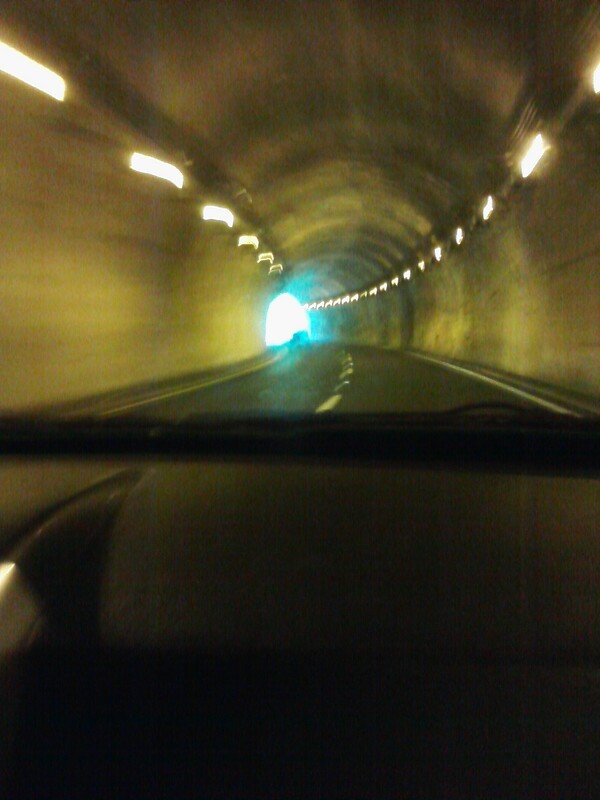 #4 Its fun to honk the horn when you are driving through a tunnel cutting through a mountain. Its as much fun being the one doing the honking as it was being the child begging her dad to honk all those years ago. # 5 The Smoky Mountians really ARE smoky….no matter what time of day it is. #6 Red twizzlers candy and Chex Mix are good road foods for a trip of this nature. 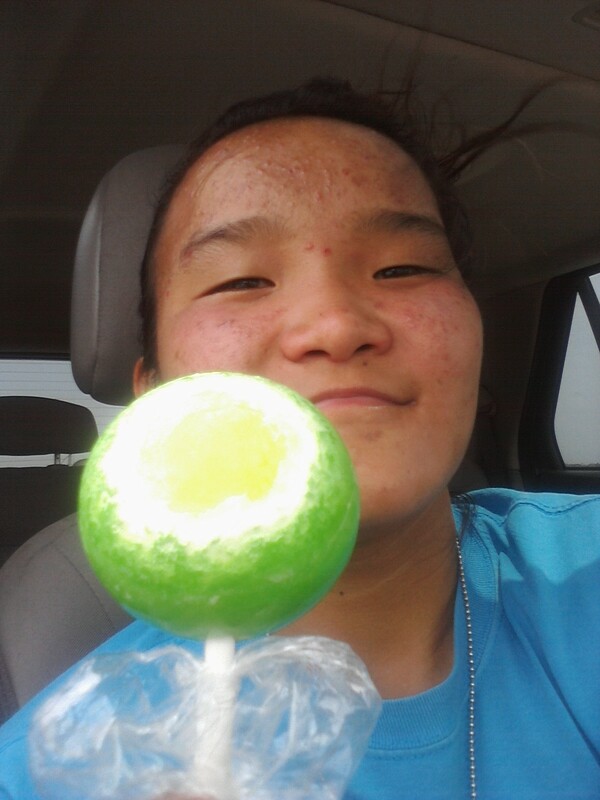 #7 It takes 2 hours and 45 minutes to lick your way to all of the colors on a giant jaw breaker sucker from Cracker Barrel. #8 A child cooped up in a car and hopped up on Red Twizzlers candy can find something funny in anything. #9 Asheville and Nashville sound pretty funny together when you are hopped up on Red Twizzlers. Asheville and Nashville……just try saying that five times fast. #10 SOME questions are…maybe….just best left answered by thumbing through a copy of a ‘growing up’ book…..by yourself. #11 McDonalds and Burger King seem to alternate which chain will have the best kept restrooms on any given trip.